Info "Go, Speed Ribbit, Go!" The Lily Cup is one of the animal related microgames from Kat and Ana's stage, in WarioWare: D.I.Y. Showcase. There are two frogs, a brown and a green one. 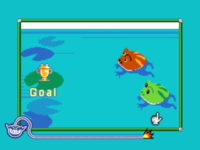 The objective of the game is to tap repeatedly the green frog to make it swim, and reach the goal first. If the brown frog wins the race, the player loses. This page was last edited on October 8, 2018, at 22:18.